This web site is the clearing house of information on the insect and spider collections of the world. The information presented here is based primarily on the 1993 book, "The Insect and Spider Collections of the World", 2nd edition, by R.H. Arnett, G.A. Samuelson & G.M. Nishida, with substantial additions and corrections. This is NOT the place to request identifications of insects or related arthropods. Our current listing does NOT follow the rigid 4-letter “coden” formula of collection depositories found in Arnett et al (1993). We are instead striving to use the letter abbreviations/combinations that are most commonly used by the collections themselves or have been traditionally used to indicate a particular depository. We encourage authorized representatives of collections to check our list to ensure that the abbreviation we have listed is the one you prefer. If not, please let us know and we will change it if possible. In the inevitable case of homonyms in the use of a particular abbreviation, we will give first preference to the older, more established depository, and then on a first-come first-served basis. 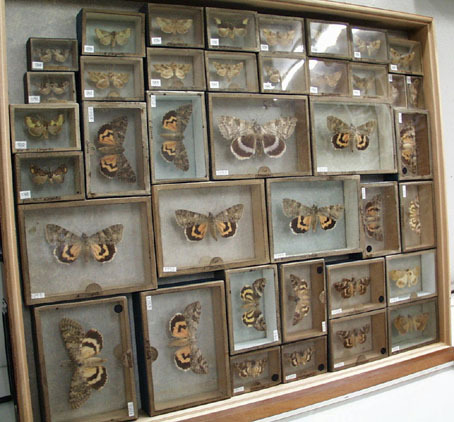 The following is a list of repository "abbreviations" (we use this term in preference to codens, as explained in the introduction) for known insect and spider collections worldwide, and includes variations that have appeared in the literature if known to us. We doubt that the list is complete and we will welcome additions and corrections. If you do not see a particular collection you know exists, please send the pertinent information including a unique abbreviation and a url of a web page (if it has one) and we will add the information to this list. We do NOT list personal collections any longer. Exceptions to this will only be made for historical collections that are missing from his list that have been deposited in a publicly accessible institutional collection. We welcome any additions and corrections to this list and request that authorized representatives from each collection have approved any proposed additions or changes before a request is made to us. Evenhuis, N.L. [year of latest version]. The insect and spider collections of the world website. Available at: http://hbs.bishopmuseum.org/codens/ [Last accessed: date]. AFRC South Africa, Pretoria, Villieria, AfriBugs, CC. AJKC Alfred J. Kistler ? AMCL Brazil, Amapa, Macapa, Museu Territorial de Historia Natural "Angelo Moreira da Costa Lima"
CELM Colombia, Bogotá, Colección Entomologica "Luis Maria Murillo"
CLSJ C. L. Staines, Jr.
CVCJ Charles Van Orden Covell, Jr.
DCLG D. C. L. Gosling ? DERC Donald E. Rich ? DEZC Italy, Torino, Dipartimento di Entomologia e Zoologia Applicate all'Ambiente "Carlo Vidano"
DGKC David G. Kissinger ? DLPC David L. Pearson ? DPWC David P. Wooldridge ? EBCC Mexico, Jalisco, San Patricio, Universidad Nacional Autónoma de Mexico, Estación de Biología "Chamela"
ECMC Edward C. Mignot ? EDWC Edward D. Weidert ? EHSC Eric H. Smith ? FCNI Australia, New South Wales, Beecroft, Forest Commission of N.S.W. FDUC USA, New Jersey, Rutherford, Fairleigh Dickinson University [collection transferred to FSCA]. FSAC Forrest St. Aubin ? GCGC Grant C. Gaumer ? GEFC Gerard E. Flory ? GLCC Gilbert L. Challet ? HISC Harvey I. Scudder ? HLBC Hugh L. Burns, Jr. ? HRSC Harrison R. Steeves, Jr. ? IEAM Italy, Milano, Istituto di Entomologia dell'Università degli Studi [= Istituto di Entomologia Agraria dell'Università, Milan]. IEGG Italy, Bologna, Università di Bologna, Istituto di Entomologia "Guido Grandi"
IICT Portugal, Lisboa, Centro de Zoologia do I.I.C.T. ITCC Italy, Vercelli, Istituto Tecnico Stattale "Camillo Cavour"
ITCO Italy, Lecce, Istituto Tecnico Commerciale "Oronzio Gabriele Costa"
JBKC Jay B. Karren ? JCAC Jean Charles Aube ? JCVB Jack C. Von Bloeker ? JFBC J. F. Brimley ? JFCC J. F. Cornell ? JHBC James H. Baker ? JHRC John R. Robinson ? JKBC John K. Bouseman ? JRPC Jack R. Powers ? JVMJ John V. Matthews, Jr.
LCAC L. Clair Armin [deceased] ? LFJR Leonard C. Ferrington, Jr.
LGWC Laurel G. Woodley ? LLLJ Lester L. Lampert, Jr.
LRGC Lorin R. Gillogly ? MACN Argentina, Buenos Aires, Museo Argentina de Ciencias Naturales "Bernardino Rivadavia"
MBCG Italy, Bergamo, Museo di Scienze Naturali "Enrico Caffi"
MCAS Italy, Alba, Museo Civico Archeologico e di Scienze Naturali "F. Eusebio"
MCBR Italy, Termini Imerese, Museo Civico "Baldassarre Romano"
MCCB Italy, Bra, Museo Civico "Craveri"
MCFM Italy, Castelbuono, Museo Civico "Francesco Minà Palumbo"
MCGS Italy, Imola, Museo Civico "Giuseppe Scarabelli"
MGAB Romania, Bucharest, Museum of Natual History "Grigore Antipa"
MIUP Panama, Universidad de Panamá, Museo de Invertebrados "G.B. Fairchild,"
MJLC M. J. Laliberte ? MNDG El Salvador, San Salvador, Museo Nacional "David J. Guzman"
MNHNSD Dominican Republic, Santo Domingo, Museo Nacional de Historia Natural "Prof. Eugenio de Jesús Marcano"
MSDB Italy, Torino, Museo di Storia Naturale "Don Bosco"
MSNG Italy, Genova, Museo Civico di Storia Naturale "Giacomo Doria"
MSPC Italy, Varallo, Museo di Storia Naturale "Pietro Calderini"
MZFN Italy, Napoli, Museo Zoologico dell'Università "Federico II"
MZRO Italy, Verona, Museo Civico di Storia Naturale "P. Zangheri"
MZUF Italy, Firenze, Museo Zoologico "La Specola"
MZUR Italy, Roma, Museo di Zoologia, Università degli Studi di Roma "La Sapienza"
MZURT Italy, Roma, Museo di Zoologia e Anatomia Comparata, Università degli Studi "Roma Tre"
PESC Paul E. Slabaugh ? RDGC Robert D. Gordon ? RESC Ronald E. Somerby ? RLWC Richard L. Watson ? RMYC Ronald M. Young ? RWCJ Robert William Cavanaugh, Jr.
SVAM USA, Pennsylvania, Latrobe, St. Vincent Archabbey Museum [transferred to several collections, see especially CMNH]. TCBC Thomas C. Barr, Jr. ? TMNJ Thomas N. Neal, Jr.
TOTC T. O. Thatcher ? TPMR Tomas P. Moore R.
UASC Bolivia, Santa Cruz de la Sierra, Museo de Historia Natural "Noel Kempff Mercado"
UNCM Colombia, Medellín, Museo de Entomologia "Francisco Luis Gallego"
UPRG Peru, Lambayeque, Universidad Nacional "Pedro Ruiz Gallo"
WRSC Walter R. Suter ? WSCC Wilfred S. Craig ? WYWC W. Y. Watson ? ZFMK Germany, Bonn, Zoologisches Forschungsmuseum "Alexander Koenig"
Copyright © Bishop Museum. All rights reserved. All media are for the personal use of students, scholars and the public. Any commercial use or publication of them is strictly prohibited.